The Race for Energy: What Will It Mean for Western Firms? Rising energy demand from China and India has unleashed a worldwide race to secure access to scarce fossil fuel resources, a more difficult proposition with the emergence of national oil companies in the resource-owning countries. While Western companies will likely feel the pain of increasing energy costs, there is a potential upside to global energy scarcity, according to experts from Wharton and The Boston Consulting Group: Renewable and nuclear energy present huge opportunities for investors and entrepreneurs, underscored by concern over a global stalemate surrounding curbs on carbon-dioxide emissions. The International Energy Agency (IEA), an autonomous body set up within the framework of the Organization for Economic Cooperation and Development, says in its November 2007 World Energy Outlook that “if governments around the world stick with current policies, the world’s energy needs would be well over 50% higher in 2030 than today.” Global energy demand would grow an average of 1.8% annually, from 11.4 billion tons of oil equivalent (toe) in 2005 to 17.7 billion toe by 2030. Fossil fuels would make up 84% of that increase, the report notes, although oil’s share would fall from 35% to 32% while coal’s share would jump from 25% to 28%. Worldwide, the IEA expects an investment need of about $22 trillion in energy-supply infrastructure. Not surprisingly, its latest report is focused on China and India; these two countries account for 45% of the increase in demand in the “reference scenario” it forecasts. China’s energy-supply infrastructure would need investments of $3.7 trillion until 2030, while India’s would need $1.25 trillion, the IEA says. The dramatic growth of the Chinese and Indian economies in recent years has caught stakeholders in the global energy industry ill-prepared, according to Hal Sirkin, senior partner and managing director at BCG and head of its global operations practice. “China and India are changing the global balance points in resources,” he says, noting that the emerging consumer markets in these two countries are behind the boost in demand. Rick Peters, senior partner and former leader of BCG’s energy practice, points to “a lot of deals and a lot of effort on the part of India and China to lock up the incremental production.” Adds Sirkin: China wants to be an investor, “not because it wants to invest, but it has an imperative to get access to resources and that is the best way.” As the world’s oil majors rush to secure their supplies of hydrocarbon reserves, they are encountering wholly unfamiliar territory. “Increasingly, the balance of power has shifted,” Peters says. 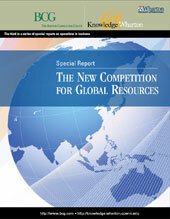 Until several years ago, “these super majors could go into the resource-holder countries and were welcomed because of their unique expertise.” The entry of Chinese and Indian oil companies competing for the same resources has provided the resource owners many more options in securing more favorable terms, he notes. Resource owners across Latin America, the former Soviet Union and Africa are also trying “to do a lot more on their own,” Peters adds. For successful developers, the model is very much shifting to local development, technology transfer, and companies and divisions within countries having a localized face. “That model is the right model. You have to be more and more creative about the win-win opportunities.” The resource owners “have become much more aggressive and savvy about relinquishing their rights to those resources and the conditions under which they will relinquish [them],” Balagopal points out. Henisz predicts that “one or two or three Chinese and Indian or Russian state-owned oil companies will emerge as globally integrated producers of oil that will rival Exxon Mobil, Shell and BP.” He says consolidation within the industry is an imperative, and that it will provide “at least perceived security of oil supplies for China and India” and a greater pool of investment resources. Wharton management professor Mauro Guillen cites Gazprom, Russia’s state-owned natural gas company, as an example of governments’ reneging on their commitments. “Gazprom is continuously renegotiating deals with foreign companies, and in the long run this is going to come back and hurt it; people are going to get the impression it is not reliable,” he says. Gazprom “is way too much an instrument of the Russian government to project its power”; governments should not use their state-owned companies as foreign-policy instruments, he argues. “If anything, it should be the other way around. Governments should help their companies grow. For the oil majors, India is unlike Angola, Chad or Sudan, where they have an advantage because of their size and clout, Henisz adds. “If you have to forecast who is going to capture the rents in India, China and Russia, it will be the Indian, Chinese and Russian firms. They are big enough, powerful enough and have the domestic capital base to fund their investments.” In what represents a new trend, he says, oil majors are winning projects by forging partnerships with engineering services firms such as Halliburton and Bechtel. Guillen suggests that while many companies in the United States and Europe “are going to be hurt” by the rise of China and India, the new opportunities will be “tremendous.” For instance, U.S. and European companies could supply capital equipment and technology required to build the infrastructure in China and India to support their growing domestic and export industries. Renewable energy resources are presenting vast new opportunities for investors and entrepreneurs, says Paul Kleindorfer, emeritus professor of operations and information management at Wharton and professor at INSEAD. “Responsive parliaments” in the European Union and elsewhere are encouraging investors in renewable energy by legislating minimum demand and floor prices, he notes. In January, the EU specified targets for its member countries to achieve on greenhouse gas emissions. Dubbed “20/20/20 by 2020,” they seek to ensure that by 2020, Europe cuts greenhouse gas emissions by 20%, produces 20% of its energy from renewable sources and increases energy efficiency by 20%. Kleindorfer notes that there are “interesting possibilities in nuclear power, all the way from the birth of plants to decommissioning old nuclear power plants at the end of their useful life.” The nuclear energy industry is “alive and well” in France, and robust in many Pacific Rim countries including Japan and Taiwan, he says. “The U.S. remains pretty much a cold fish on the nuclear front. But globally, that is not the case.” Kleindorfer is also optimistic about the possibilities of a “hydrogen economy” that fuels both industrial uses and personal transportation. “There is plenty of hydrogen in the universe and it doesn’t have any CO2 in it,” he says. Developing countries will account for nearly three-quarters of the increase in global energy use over the next two decades, and the share of coal in that mix will increase significantly, the IEA predicts. “Higher oil and gas prices are making coal more competitive,” the IEA says in its energy outlook report, adding that India and China, which already account for 45% of the world’s coal use, will account for more than 80% of the increase in its use between now and 2030. That scenario forces policymakers across the world to address issues that have frustrated agreement on containing carbon dioxide emissions. The United States wants to have “precommitments” from India and China on their emissions targets before it makes its own commitments. That is the key obstacle, says Kleindorfer. He points out that India and China feel that the United States has had its share of consuming fossil fuels and that now it’s their turn. “India and China are saying that they are not interested in something that doesn’t recognize their right to grow to achieve a standard of living that is in some ways approximate to that of the U.S.,” Kleindorfer says. The United States must “reestablish itself as a player rather than its current position of more of a barrier to the implementation of agreements such as the Kyoto protocol.” He suggests it take cues from the EU’s “20/20/20 by 2020” policy. In any event, he expects traction on that front only after the U.S. presidential election in November. Choosing the right strategies may be difficult with so many moving pieces in the emerging energy scenario, but Henisz cites Royal Dutch Shell as an example of a decisive corporation. In a January letter to all employees, CEO Jeroen van der Veer said, “By 2100, the world’s energy system will be radically different from today’s.” He forecast that solar, wind, hydroelectricity, biofuels and nuclear energy will make up a large share of the energy mix.